Heiber, A. and Spielmann, T. (2014). Preparation of Parasite Protein Extracts and Western Blot Analysis. Bio-protocol 4(11): e1136. DOI: 10.21769/BioProtoc.1136. Heiber, A., Kruse, F., Pick, C., Gruring, C., Flemming, S., Oberli, A., Schoeler, H., Retzlaff, S., Mesen-Ramirez, P., Hiss, J. A., Kadekoppala, M., Hecht, L., Holder, A. A., Gilberger, T. W. and Spielmann, T. (2013). 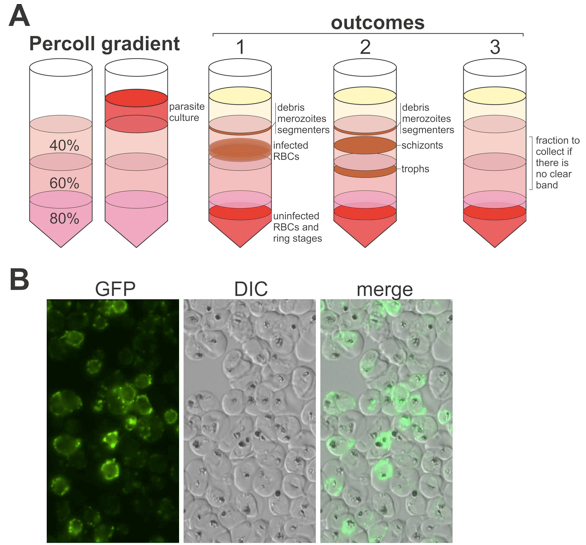 Identification of new PNEPs indicates a substantial non-PEXEL exportome and underpins common features in Plasmodium falciparum protein export. 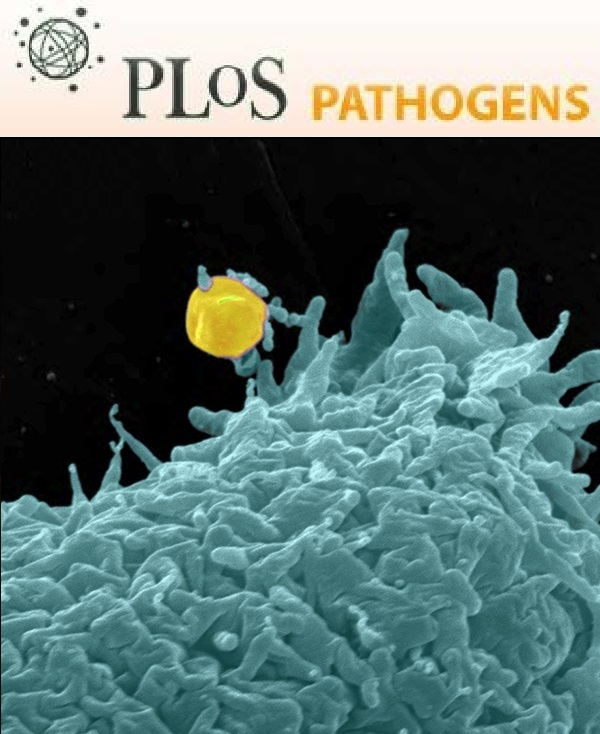 PLoS Pathog 9(8): e1003546. In order to prepare protein extracts of Plasmodium falciparum blood stages for western blot analysis, infected red blood cells (iRBC) need to be separated from uninfected red blood cells (uRBC) which make up the bulk of the parasite culture. Depending on the localisation of the parasite protein of interest, different methods are available to achieve this. If the protein is present within the parasite or is attached to a cellular structure of the iRBC cell, saponin can be used. This reagent lyses the membranes of infected and uninfected erythrocytes, the Maurer´s clefts (vesicular structures in the iRBC) and the parasitophorous vacuole membrane containing the parasite but leaves the parasite plasma membrane intact, providing a convenient procedure to isolate intact parasites without uRBCs. However, this method has the disadvantage that the host cell cytosol and the parasitophorous vacuole (PV) content of iRBCs are lost. If this has to be avoided, it is possible to use a Percoll gradient to separate intact iRBCs from uRBCs. Sequential treatment with Tetanolysin and saponin can then be used to selectively release the iRBC cytosol and the PV content from the parasite. These selective lysis methods are also suitable to determine the subcellular localisation of a protein of interest. Note: All centrifugation steps are carried out at room temperature. Saponin lysis to remove the soluble PV content, the host cell cytosol and uRBC. Centrifuge 10 ml of a Plasmodium falciparum culture (5-10% parasitemia) at 500 x g for 5 min, discard the supernatant and resuspend the pellet in 10 ml 1x PBS. Centrifuge again, resuspend the pellet in 4 ml saponin lysis buffer (0.03%) and incubate on ice for 5-20 min. Centrifuge the lysate at 16,000 x g for 5 min to pellet the parasites and repeatedly wash the pellet with 1x PBS until the supernatant shows no red colour anymore. Note: Usually 3 washing steps are necessary. Discard the supernatant and add 2-8 µl 25x protease inhibitor cocktail. Depending on the size of the parasite pellet, resuspend the pellet in 50-200 µl parasite lysis buffer. Note: In general 100 µl parasite lysis buffer will work for 10 ml of a parasite culture >5% parasitemia but this depends on the proportion of schizont stage parasites as these stages contain a lot of DNA. Addition of DNase can be used to reduce the viscosity of the extract. The extracts can be stored at -20 °C if not used immediately for SDS-PAGE. Percoll gradient to obtain intact iRBC followed by saponin lysis to separate soluble host cell and PV content from parasite material. Centrifuge 10 ml of a Plasmodium falciparum culture (5-10% parasitemia) at 500 x g for 5 min, discard the supernatant and resuspend the pellet in 10 ml 1x PBS. Centrifuge again and remove the supernatant. Prepare the percoll gradient by adding first 500 µl 80% percoll solution to a 2 ml tube, then carefully layering 500 µl 60% percoll solution on top of the 80% percoll and finally layering 500 µl 40% percoll solution on top of the 60% percoll (Figure 1, Percoll gradient). Note: Use the gradient immediately. Resuspend the pellet with 200 µl 1x PBS and slowly pipette the parasite solution on top of the gradient. Centrifuge immediately at 16,000 x g for 5 min. Note: Touch the side of the tube with the pipette tip while adding the parasites to avoid mixing of the solutions. Carefully collect the desired parasite stage band into a new 1.5 ml tube (see Figure 1 for selection of correct phase from the gradient) and add 1 ml 1x PBS. Note: If too much percoll solution is transferred, for instance if no clear iRBC phase was apparent (Figure 1A, scenario 3), the parasites may not pellet properly after the first washing step. In this case only remove the top region after centrifugation of the first wash, and replace again with 1x PBS to bring down the overall percoll concentration of the solution. The iRBCs should then pellet after in the next centrifugation step. Centrifuge at 16,000 x g for 5 min and wash the parasite pellet at least 3x with 1 ml 1x PBS. Note: Use a fresh tube for each washing step. Resuspend the pellet in 50 µl PBS, then add 50 µl saponin lysis buffer (0.03%) and incubate on ice for 5 min. Centrifuge the lysate at 16,000 x g for 5 min. Transfer the saponin supernatant into a fresh tube (final extract of host cell cytosol and PV content) and add 4 µl 25x protease inhibitor cocktail. The extract can be stored at -20 °C if not used immediately for SDS-PAGE. Wash the pellet with 1x PBS until the supernatant is clear. Note: In general 3 washing steps are necessary. Add 4 µl 25x protease inhibitor cocktail to the pellet. Resuspend the pellet in 100 µl parasite lysis buffer. The extract can be stored at -20 °C if not used immediately for SDS-PAGE. Figure 1. Percoll gradient and outcomes. A. Preparation/Set-up of a Percoll gradient without and with parasite culture (top left). Three possible results after centrifugation are shown under 'outcomes' (top right): 1) one band consisting of mostly debris, merozoites and segmented schizonts at the border between the 40% Percoll and the aqueous region (present above the 40% percoll after centrifugation) and one band above uRBC/ring stage region consisting of younger schizonts and trophozoites (This is the fraction to harvest. ); 2) similar appearance to 1) but with multiple bands below the debris/merozoites/segmented schizonts phase; these bands usually consist of different stages of iRBCs and can all be collected; 3) no clearly defined band; in this case collect the indicated fraction (from the mid 40% to the region just above the uRBCs and ring stage phase, making sure not to disturb this phase). Although in this case the stages may be too distributed to be seen as a clear band in the gradient, this usually will still result in a good recovery once pelleted and washed. B. Example of a purification of iRBCs infected with PF13_0191-GFP parasites. GFP, PF13_0191-GFP fluorescence; DIC, differential interference contrast; merge, both images merged. Percoll gradient and sequential treatment with tetanolysin and saponin to obtain extracts of the host cell cytosol and the PV content, respectively. Resuspend the parasite pellet in 99 µl 1x PBS and add 1 µl tetanolysin (1 µg/ml). Mix the solution immediately by flipping the tube with your finger. Incubate at 37 °C for 30 min. Note: The tetanolysin activity may vary with batch and depending on the number of freeze thaw cycles of the aliquot used. If standardised results are needed, activity testing with uRBCs can be conducted before each use. For this incubate serial dilutions of tetanolysin with 20 µl of 70% haematocrit RBCs for 1 min at 37 °C followed immediately by centrifugation at 16,000 x g for 3 min to assess lysis (pellet of uRBCs left). For the percoll pellet use 10x the amount of tetanolysin required to just lyse all of the 20 µl uRBCs. Note that the actual number of parasites obtained after percoll purification also influences lysis efficiency. Centrifuge the lysate at 16,000 x g for 5 min. Transfer the tetanolysin supernatant into a fresh tube (final extract of host cell cytosol) and add 4 µl 25x protease inhibitor cocktail. The extract can be stored at -20 °C if not used immediately for SDS-PAGE. Resuspend the pellet in 50 µl 1x PBS, add 50 µl saponin lysis buffer and incubate on ice for 5 min. Prepare a polyacrylamide gel with a 5% stacking and a 12% separating gel, 0.75 mm thickness. Centrifuge the (thawed) parasite protein extract at 16,000 x g for 5 min and transfer the supernatant into a fresh tube. Add the required amount of 5x SDS sample buffer and incubate at 95 °C for 5 min. Note: Some multi-transmembrane proteins can aggregate if heated, warming the extract to 50 °C may then be applied. Load the prestained protein ladder (4 µl) and 8 µl of the extract into the slots of the gel in the electrophoresis chamber filled with electrophoresis buffer and run the gel at 200 V for 1 h.
Soak a nitrocellulose membrane and 6 sheets of chromatography paper cut to the size of the gel in 10 mM CAPS (pH 11.2). Prepare the blot in the following order: anode (+), sponge, 3 sheets of chromatography paper, the nitrocellulose membrane, the SDS gel, 3 sheets of chromatography paper, sponge, cathode (-). Perform protein transfer in a tank blot device at 15 V per gel and 4 °C over night. Dismantle the blot-sandwich and immediately transfer membrane to 1x PBS for a brief rinse. Note: Gel can be stained with Coomassie to check efficient transfer. Incubate the membrane with 10 ml blocking solution in a 50 ml falcon tube at room temperature for 1 h on a rolling device. Replace blocking solution with 5 ml of fresh blocking solution. Add 5 µl primary antibody (e.g. mouse anti-GFP 1:1,000) to the blocking solution and incubate the membrane at room temperature for 3 h on a rolling device. Wash the membrane 5x with 10-20 ml 1x PBS at room temperature for 5 min on a rolling device. Dilute 1.7 µl secondary antibody (e.g. horseradish peroxidase-conjugated goat anti-mouse 1:3,000) in 5 ml blocking solution and incubate the membrane at room temperature for 1 h on a rolling device. Incubate the membrane with enough ECL solution to cover the blot (1.5-3 ml) at room temperature for 5 min on a rolling device. Transfer the membrane between 2 layers of transparent sheets. Apply X-ray films for different times in the dark. Develop the X-ray films in the developer. The use of pore-forming toxins in P. falciparum was pioneered by the Lingelbach lab: Ansorge et al. (1996). The Percoll gradient is a modified version of the protocol from Aley et al. (1986). Aley, S. B., Sherwood, J. A., Marsh, K., Eidelman, O. and Howard, R. J. (1986). Identification of isolate-specific proteins on sorbitol-enriched Plasmodium falciparum infected erythrocytes from Gambian patients. Parasitology 92 (Pt 3): 511-525. Ansorge, I., Benting, J., Bhakdi, S. and Lingelbach, K. (1996). Protein sorting in Plasmodium falciparum-infected red blood cells permeabilized with the pore-forming protein streptolysin O. Biochem J 315 (Pt 1): 307-314.